This gourmet fruit and cheese gift is always a big hit with cheese lovers. The experts at The Fruit Tree™ have paired fresh orchard D'Anjou pears and Braeburn apples with gourmet cheeses from California. They'll love premium Bellwether Farms Carmody cheese, and Fiscalini Cheddar, both handmade on small California farms. One bite and they'll delight over the exceptional taste and quality. Treat someone special to a gourmet fruit and cheese gift box. 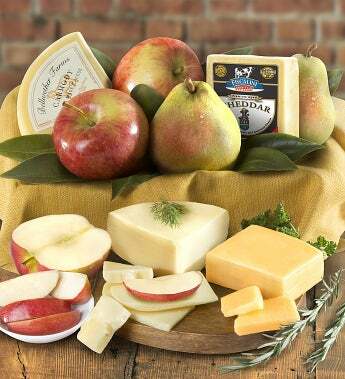 The experts at The Fruit Tree™ have paired fresh orchard D'Anjou pears and Braeburn apples, buttery Bellwether Farms Carmody cheese that's inspired by the Gorgonzola cheeses of Italy.